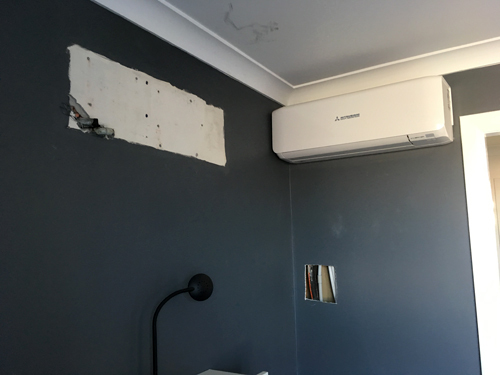 Finally, finally a couple of weeks ago we had the two non-functional air-conditioners replaced! As is always the way with any maintenance on ThePalace(OfLove) this was of course not entirely straightforward. I can’t quite remember what the actual diagnosis was, but [whatever] meant that we needed replacement pipes? drains? … something like that. 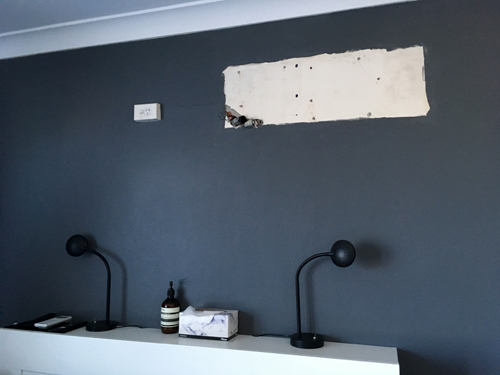 This meant that the unit in our bedroom needed relocation and the installers had to cut into the walls to access the various bits they needed. 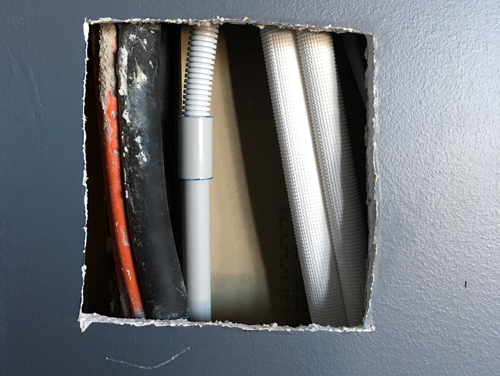 Never mind that there is a perfectly functional services duct less than 50cm away – the original builders had ignored that and gone through the walls. Of course they had. We’re now left with some rather interesting … ehancements … to our bedroom. I saw the empty space now above the bed not as a diabolical mess potentially costing quite a lot to repair, but as an opportunity to acquire new artwork – and serendipidously we had a VIP pass to Sydney Contemporary for that very night. Surely TheUniverse was telling me to buy art?! Alas, despite best intentions (though fortunately for the bank balance) what the TheUniverse was actually telling me that we needed a pleasant night out and rather than buying art we should save our pennies for repairing those multiple holes in the walls and ceiling! At current rate of pace that should be some time in 2024.